No need to restart, it should be gone as soon as you go into the shutdown menu. 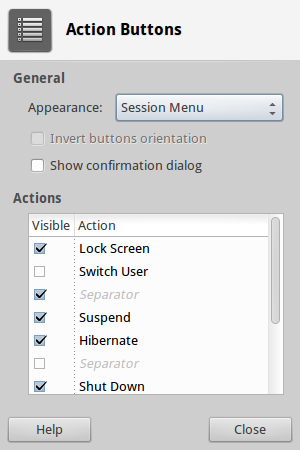 When you want to add the hibernation option to XFCE's panel, you have to right-click your name (topright) and select properties. Make sure, you check Hibernate like I did. After this, restart your machine, and upon login, you should see a hibernation option on the top right settings corner. And try to use TuxOnIce. Do not forget to save your work before you do it. If all went fine, your computer will switch off. After switching it on, you will get your desktop in the state you left in it before hibernation. I have translated above answers to bash scripts. This makes installation on multiple machines less tiresome. Note: Do not forget to chmod +x both scripts to make them executable. To enable Hibernate, I followed this answer from Dima. After enabling hibernate, I could hibernate. But the problem is, I can't successfully resume from hibernate. Any time I start my PC from hibernate, it boots like a normal boot. So, I had to do these things to be able to resume from hibernate. There is two way to fix this. First get the UUID of the swap partition. The actually line will not match with this. Copy the value of UUID in between "..." double quote. 2. Editing the /etc/default/grub file. There will be a line like GRUB_CMDLINE_LINUX_DEFAULT="quiet splash" . Edit the line to insert RESUME=UUID=<your-uuid-value-here> after the word splash. Make sure, you used your UUID value you get from sudo blkid | grep swap command. This also enable you to successfully get resumed from hibernate. Then I could successfully hibernate with sudo systemctl hibernate. There is no pm-hibernate executable in my path. Why can't I hibernate my Ubuntu 12.04? How can I activate Hibernate on Ubuntu 12.04?